A five-storey, multi-generational glass-and-concrete home on a tiny St Kilda in-fill site zoned for business sure got the neighbours and council talking. Architect Matt Gibson and design industry clients collaborated closely on this striking presence animated by its surroundings. Light, bright and bold: this architect’s Perth family home is a modern take on gable-roofed character buildings complete with top-notch views. Clea Cregan of Miniscape Projects has proven how creativity and brilliant design can prosper in projects of any shape and size. 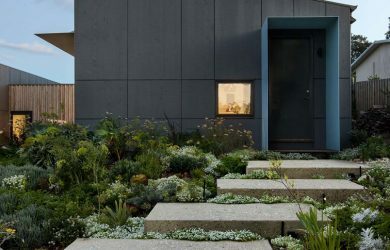 The harsh conditions of a family’s coastal property and their self-confessed plant-killing tendencies culminate in a hard-wearing, unpretentious and welcoming garden. Nick Steiner took a suburban backyard experiment and turned it into a thriving charity organisation that brings fresh produce to disadvantaged Australians. For his own weekend retreat in Wye River, architect Ben Edwards used shipping containers to create a modest building with minimal impact on the land. 'Not a McMansion’ was the brief for this Kerstin Thompson-designed beach house in Somers, which cleverly accommodates a retired couple and their regular guests with a cluster of pergola-linked pods elevated for sea breezes and views. A garden-loving client relocating permanently to Sorrento sought help from her landscape designer sister Fiona Brockhoff and architect Clare Cousins to create a private, secure, flexible beach house whose clever arrangement of pavilions, courtyards and gardens offers strong connections to the coastal environment. Bruny Island Cabin was created to satisfy the client’s yearning for retreat and renewal; a space where she could relish life’s simple pleasures: reading, playing music and stargazing. A family finds harmony with the natural world through their meticulously composed, sustainability-focused country home. Drawing on the values, traditions and textures of agricultural history, this New Zealand home pays reverence to the land.